I suppose it’s impertinent to post photos (and stories) about one’s pets, expecting anonymous others to care as much as the pet’s owner, or thinking they’ll be moved by what they see or read. But pet lovers understand, and there is a catharsis in sharing. So here’s my tale. 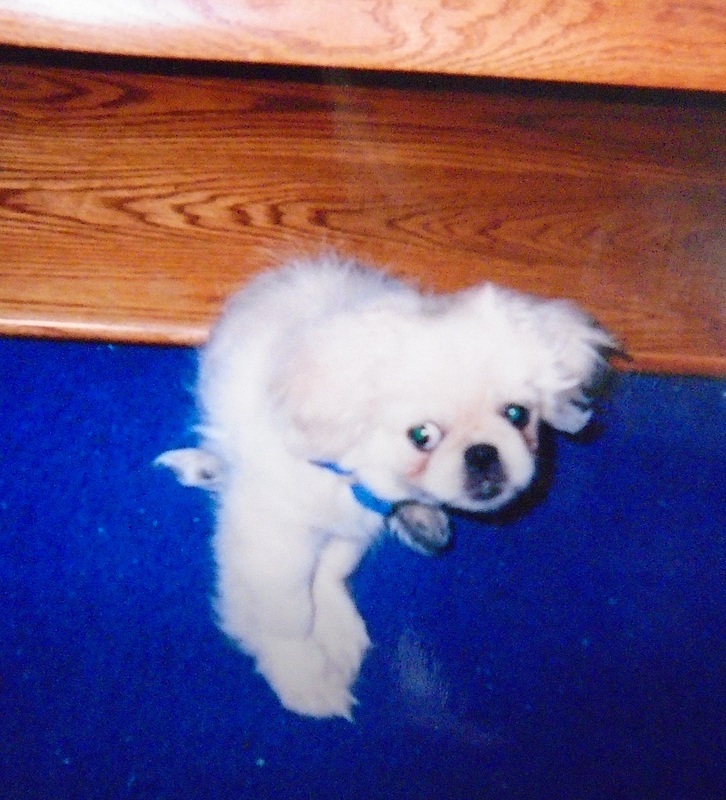 The earliest picture of Ming as a pup. 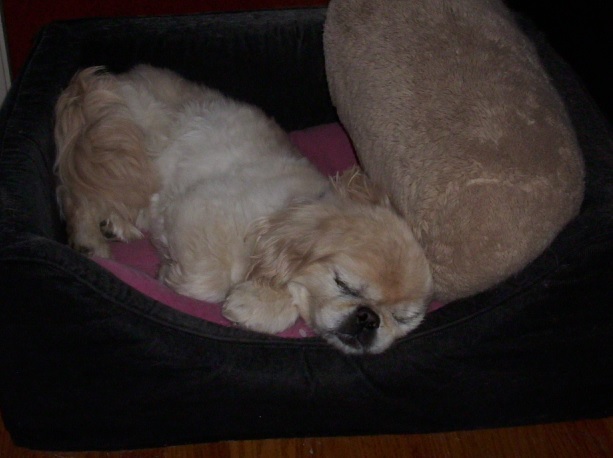 My little Pekingese Ming-Lee passed away on Wednesday, June 1st around 3:00pm just two months shy of her sixteenth birthday. She has been a part of this blog since it began with an honorable mention on the About Me page and the occasional appearance in posts over the years. She’d first come into my life in November 2000, when I had decided I wanted to get a dog. 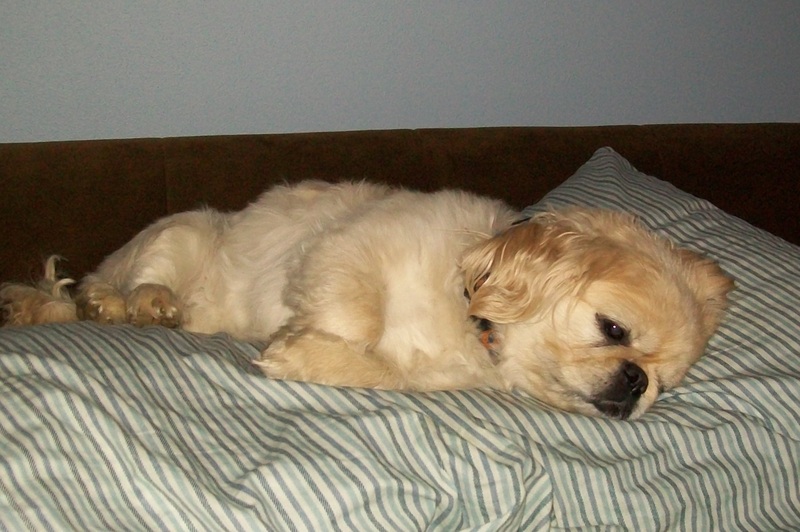 I had wanted a Pug, but when I first saw and held her, I knew the little blonde Pekingese was for me. She was a little spitfire as a pup, quickly establishing herself as the alpha over my mom’s Scottie, taking over as if she’d always been there. We only had to put her outside once for her to be potty-trained. Yes, really, once! She’d subsequently head over to the door announcing her intentions to go do her business. Resting on “Daddy’s” pillow in a photo from the past year. There had been many moments over the years, many good, a few bad. But in her fifteenth year, she’d been getting progressively weaker, finding it increasingly difficult to support herself on her hind legs. On the Saturday morning before Memorial Day she truly began to fail, not able to rise from her doggie bed without help, and not eating as she should. I knew then that I’d have to take her to the vets, but—I suppose somewhat selfishly—I wanted one last weekend with her. A fortuitous three-day holiday weekend to spend at home with her. I delayed one more day, finally making the appointment on Wednesday morning while hedging a bit on the reason. Though innately I knew the time had likely come, I wanted the vet’s professional opinion. 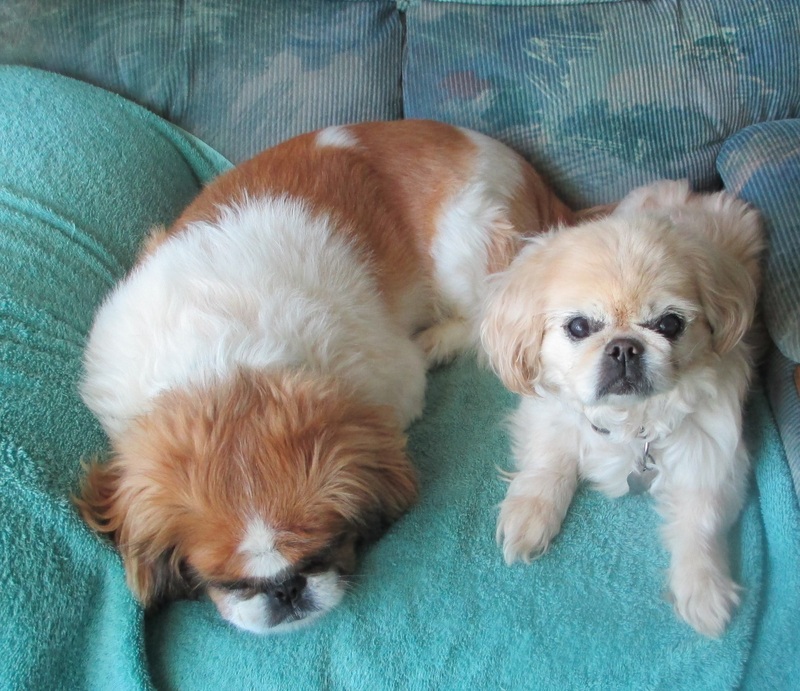 That afternoon, I gently picked her up from her bed, brought her to the bathtub to clean her up as much as possible (she’d always tired to stay clean), dried her off, and carried her over to Ching, my other Peke, to say goodbye. I placed her on the floor in the back of my car and drove out to the vets. She never made a sound. All too soon, I arrived and brought her in. I had tried to time my arrival as close as possible to the allotted appointment. I hadn’t wanted to have to linger in the waiting area and was grateful I could be shown to the examination room almost immediately. I set Ming on the padded table and she lay there on her side. The moment the vet saw Ming, she knew the real reason for the visit. She did explain briefly how they could run some tests, but that Ming’s age and condition had progressively gotten worse—as we both knew—and how it might be time. Even knowing the outcome beforehand doesn’t truly soften the blow. I teared up. Nodded my head, unable to really say anything, but understanding nonetheless. The vet explained the process. The paper that needed to be filled out and signed. The options for after, and the procedure itself. After the decisions were made, the paper signed, it was time to decide if I wanted to stay with Ming in her last moments. I asked how long the procedure would take. Not long was the answer. Knowing that made it easier to decide even though I’d been already leaning toward staying. This was my little girl who’d been with me for the past fifteen plus years. The least I could do was be there for her. She was taken in back to be prepared for the procedure, and I was left alone in the examination room. A few moments to think, raid the tissue box, cry, and brace myself for what’s to come. The vet returned with Ming, wrapped in a blanket (a lovely gesture), and set her on the table. The catheter was in her front right leg. To distract Ming from the first needle, I petted her head. She perked up a bit as if feeling that floating effect from the anesthesia (as the vet had explained). I continued petting her as the second needle was inserted. The vet used her stethoscope and told me she was gone. I’m thinking, like, “Wait, what?” It happened so sudden. In the moment, there didn’t seem to be any time to process. I thought I’d feel her passing, but everything just stopped. Quickly, peacefully, and done. The vet told me I could take as much time as needed in the room and to let the reception staff know when I was done. As I took Ming’s collar off, I asked if I could have a lock of hair—another something to hold onto for awhile. “Of course,” the vet said. Clearly it was something they did often. Alone again, I looked over the body on the table. Though the vet forgot to mention the possibility, I knew (Thank God!) about involuntary muscle moment. Still, it freaked me out when Ming’s jaw moved and her leg thumped under the blanket. But she wasn’t breathing and her heart wasn’t beating. This was just the shell of the animal that was. And the few twitches subsided. I don’t know how long I stayed. Touching her, petting her felt no different than when she was alive. As if she were in a deep sleep. I lingered, wanting to remember everything about her. Her soft blond fur, some of which had gone white in later years; her paws, the front ones were larger than the back; her curlicue tail; her dark brown eyes that had dulled with age; and her short, little muzzle and tiny teeth. In her whole life, she had average around 13 pounds. But I knew I couldn’t stay forever. I composed myself enough to face the world and left the room, closing the door behind me, to deal with business transactions. The reception staff expressed their condolences, a tuft of Ming’s hair (in a nice little baggie) was brought out, I nodded, barely able to say thank you, and left. I scarcely remember the drive home but for the tears shed along the way. There’s always the lingering afterthoughts of could I have done more for her, given her more attention. Could I have gotten her walking or eating again? Maybe for just a few more days. But ultimately I know she was nearly sixteen years old, the higher end for her breed. Ming and Ching together in a rare moment with Ming looking at the camera. She never seemed to like her picture taken. Arriving home, my other Pekingese, Ching, met me at the door. Knowing he’d be there to come home to helped lessen the blow. He seemed to look for Ming, but soon returned to the routine. I half think he’d thought I brought Ming over to my parents’ house as they often looked after both dogs, especially when I was at work. Likely he knew in that innate canine way animals have. As I write this now, a few days later, the tears have mostly dried up, but of course, I still miss her. I miss her funny little snorty growl, the way she’d wedge up against me at night, and even her finickiness and her queenly primness. In her heyday, she’d been a feisty, attention-loving Peke with a strong, independent streak. She’d been my dog first and foremost from beginning to end, and mostly, I wish I could have just one more day with her. Brian, I’m so sorry. She looks like a little sweetie pie. Your post is incredibly moving. I can certainly tell how much you cared for her. Thanks. It was nearly as hard to write about it as going through it. I can certainly relate to losing a beloved pet. We have lost 7 in 36 years we have been married and each time it doesn’t get any easier. As each one has a special place in our hearts. They do have a special place, and they’re so much a part of our lives. It felt like Ming was around forever, and yet not long enough.